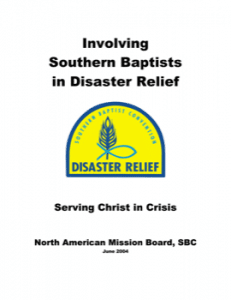 Becoming a Disaster Relief Volunteer provides an excellent opportunity for hands on service to people in need. 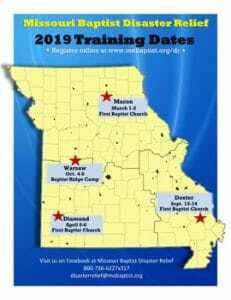 Training is open to any member of a Southern Baptist church who is at least 18 years of age. Attending training does not obligate you to serve but is necessary before serving. Background checks are required for first time volunteers and re-certifications (every five years). There are no exceptions. Retraining is required every five (5) years! 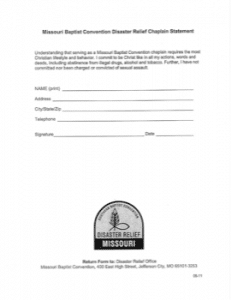 Please note you must be 18 years of age and a member of a Missouri Baptist church to be certified as a Missouri Disaster Relief Volunteer. 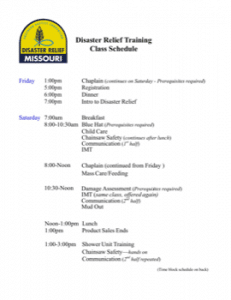 All trainees must submit a background check request, attend Introduction to Disaster Relief as well as retrain every five years in any class of your choice to remain a certified volunteer. Those training in Chaplaincy, refer to the Chaplaincy information below. previous training in other areas as well as on the job experience to attend this class. 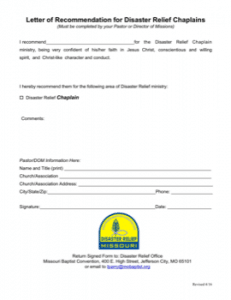 a letter of recommendation signed by your Pastor or Director of Missions. a signed statement concerning use of alcohol, tobacco and illegal drugs. must submit a background check request on-line. 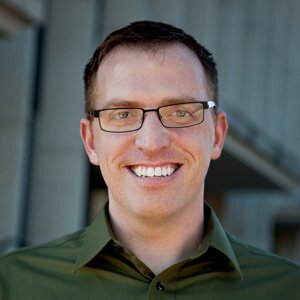 First time chaplaincy trainees: in addition to the registration fee, you have a cost for chaplain specific clothing items; currently $10. 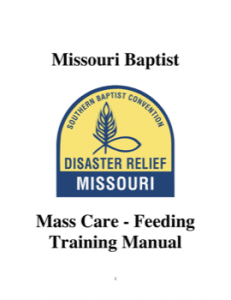 Mass care (feeding): Mass food preparation and distribution in disaster areas. 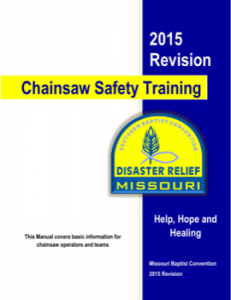 Chainsaw: Clearing trees, brush, and other major obstructions following a disaster. 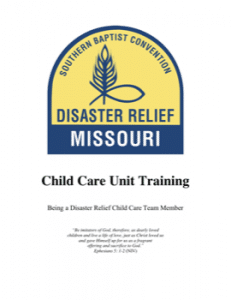 Child care: Temporary care unit working with children who are victims of a disaster. Shower unit: Provides shower and laundry support for workers and others in the disaster area. 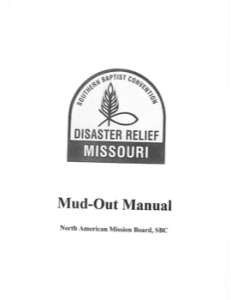 Mud out: Removing mud and other debris or filth, clean up and disinfecting following a flood. 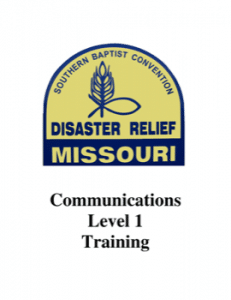 Communication: Hands on training teaches you how to provide effective communication equipment and processes for leaders, organizations and personnel in a disaster setting. If you are an amateur radio operator, IT Network guru, and/or proficient at anything related to telecom then this is the place for you. IMT Orientation: Coordinates all management aspects of a DR response. 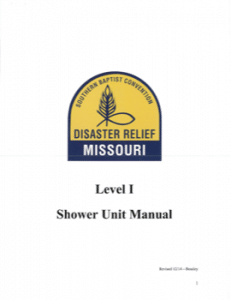 This training will introduce participants to the various components of the Incident Command System as it relates to Missouri Baptist Disaster Relief. Areas covered include but are not limite to Operations, Logistics, Administration, and Planning. Prerequisites include: minimum 2 deployments preferably in recovery but not required, computer skills, FEMA ICS 100 and 200, Blue training recommended. 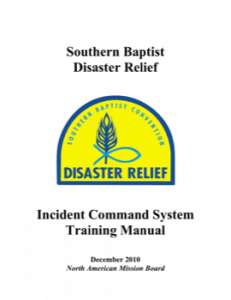 Blue Hat: By recommendation only – Unit/Crew Leader: learn paperwork, operations, responsibilities and potential problems encountered during a disaster. 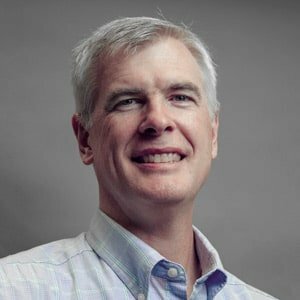 Prerequisites include: trained in other areas of DR, have practical experience working a disaster as a yellow hat, recommendation from someone in DR leadership, and be pre-approved by the MBC DR State Specialist. Assessment: By recommendation only – Learn to gather, evaluate and communicate information about the extent of damaged areas ahead of responding teams. Prerequisites include: trained in other areas of DR, have practical experience working a disaster as a yellow hat, recommendation from someone in DR leadership, and be pre-approved by the MBC DR State Specialist. You do not have to be a blue hat to take this training. 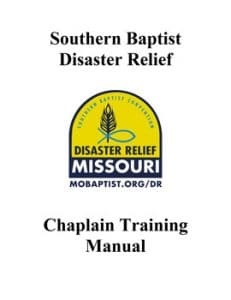 Chaplain: Provides effective counseling sessions during a disaster; involves listening, caring, encouragement, and seeking evangelistic opportunities. Prerequisites include: trained in other areas of DR, and have practical experience working a disaster as a yellow hat.